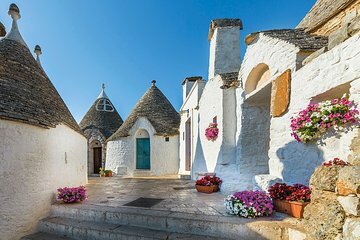 If you love to explore independently, leave Italy’s crazy traffic to the experts and join this full-day door-to-door transport-only tour of some of Puglia’s most scenic towns and villages. Start at the pretty seaside village of Polignano a Mare; continue to Alberobello, a UNESCO World Heritage Site for its extraordinary “trulli” structures; stroll among Locorotondo’s flower-decked balconies; conclude with the “white town”, Ostuni. Tour is capped at just eight travelers.